Chhapak…chhapak. The oarsman slowly rows his shikara, a wooden taxi houseboat, as I breathe fresh air and put my fingers into the cold water. 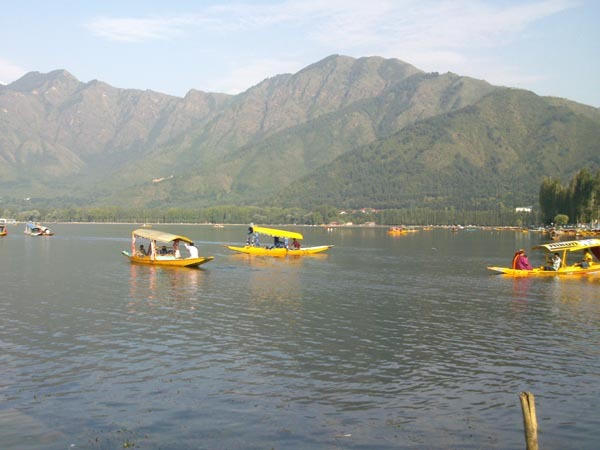 This is my first visit to Kashmir and I always wanted to visit it – to take a shikara ride alone on the splendiferous, enchanting Dal Lake in paradise, that is Kashmir. A unique experience indeed; every now and then I go into a state of trance, a psychological state induced as if by a magical incantation. There is something intoxicating in this air. It puts me in a daze. In a nearby mosque, a muazzin calls out the Azan (call for prayer), and cool breeze wafts the prayer across the lake. ‘Allahu Akbar‘ (God is Great) he chants four times. The atmosphere is soothing and peaceful. They say the Azan, and not the sun, begins a new day in Kashmir. It is at this point of time the rower, Suhail, chimes in. “Can you see over there? Yes, that is Pari Mahal, a terraced garden. A lot of Bollywood movies have been shot there. You must have watched the famous song from Sanjeev Kumar and Suchitra Sen starrer, Aandhi (1975), ‘Tum aa gaye ho (now that you have come)’, it was filmed here,” Suhail asseverates, whilst pointing towards a mountain. “Prithee, look at your left side. Not right, left side sahib (sir). Yes, here, in this very houseboat, Mission Kashmir was shot,” he informs me, as he greets the houseboat owner in Kashmiri. 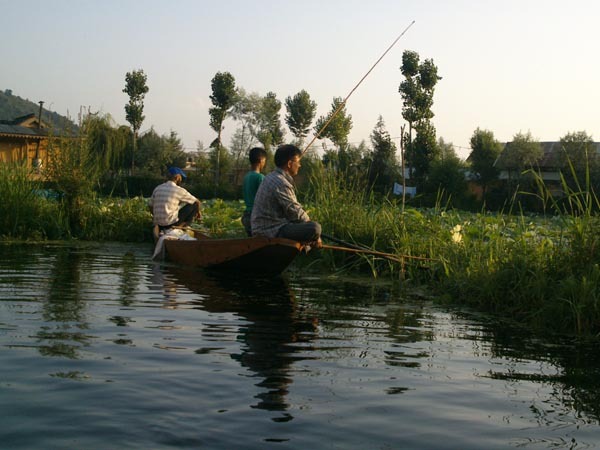 The Dal Lake is a world of its own. At some distance, a few hawkers on their shikaras approached us. One of them asks me if I would like to buy any souvenirs for someone special; another wants to know if I would like to get pictures clicked in traditional Kashmiri attire; another offers Kashmiri kebabs, kahwa, perfumes and flowers, but I politely decline all of them. I am too intoxicated by the surrounding spectacles that pulsate with life and vitality. “Bhaisahab, akele akele kyun ghoom rahe ho Kashmir? Kamal hai”. “Do not worry. I am sure next year he will not be alone in my shikara,” Suhail butts in, making us all burst into peals of laughter. After exchanging light banter, Suhail shows me the Nehru Park that is situated amidst the lake and the famous Floating Gardens, which are land masses used for vegetable cultivation. I am told there is not a single vegetable that is not grown here. 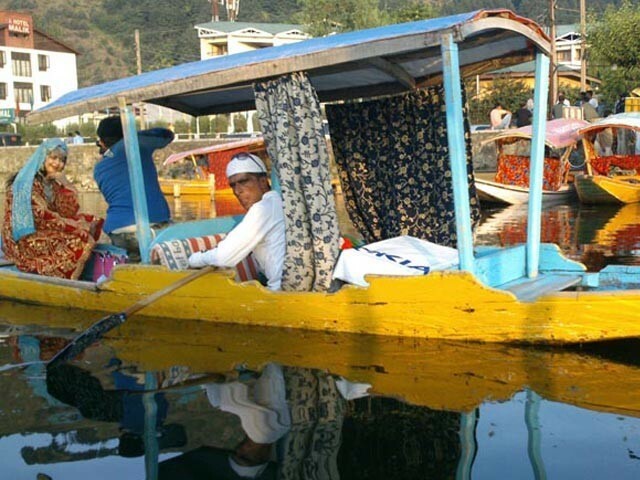 He offers to take me to a few local handicraft shops on the lake as well, hoping I would buy something. But I am more interested in having a conversation with him. “Yes, Modi. When he came here, the authorities had to impose a curfew for two days. Such is the current state of affairs,” Suhail sighs. I should change the topic, I thought to myself. “Ah, not like this,” Suhail interrupts me. “Yes, hami asto, hami asto hami ast,” I repeat. Alas, so much has changed in the last two months. Kashmiris, on both sides of the border, are braving one of the worst floods that have occurred in a long time. Scores have been killed; thousands have been rendered homeless and marooned without food and drinking water. 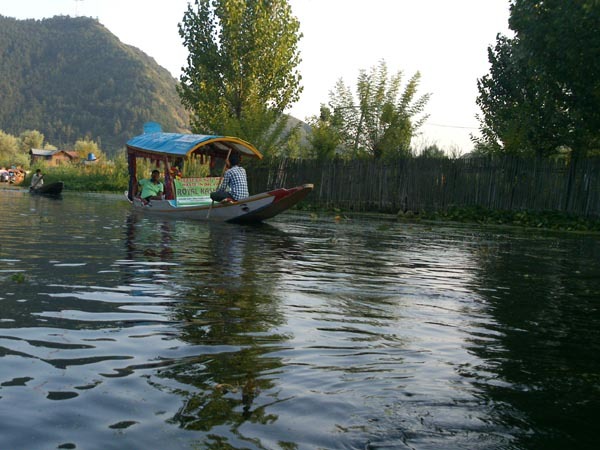 The beautiful Dal Lake, where I had spent the best time of my life, has been ravaged by the flood waters. 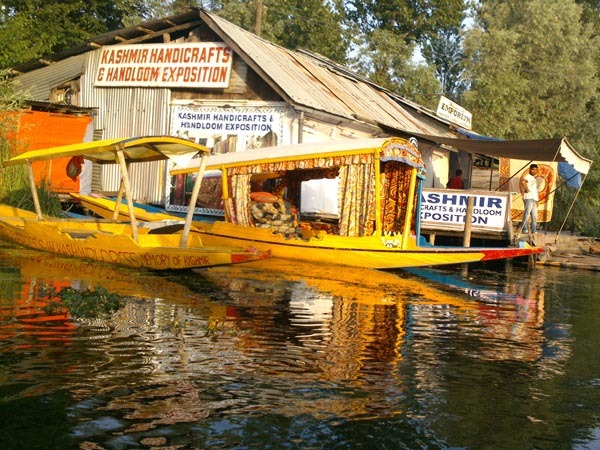 It has caused many houseboats to sink, not to mention it has snatched the bread and butter of many Kashmiris. I am very anxious about the well-being of my kind houseboat owner, Farooq bhai and his family. 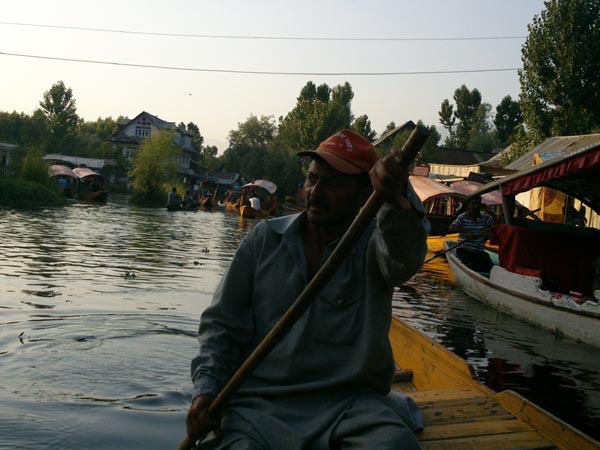 I stayed in ‘Daffodil,’ moored on the banks of river Jhelum for three days. I cannot stop thinking of my Kashmiri mai, his mother, who took care of me like her own son. 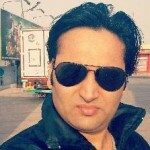 I am also worried about my dear shikara friend, Suhail. I hope he and his loved ones are safe. The other day I spoke to one of my Kashmiri friends in Delhi and he told me his family is stuck in the Bemina district of Srinagar. He has not been able to contact them for the last several days as phone lines are dead and there is no electricity to charge mobile phones. “Everything is destroyed,” my friend tells me as he breaks down over the phone. Before Omar Abudullah, Kashmir’s CM could even call an all-party meeting in Srinagar, Modi had already visited and pledged the people of Kashmir the money and the help from rest of India and left. Yeah, as If it would have been different if Nelson Mandela had visited Kashmir after being chosen as Indian PM. Saffron lord if that is what you want to address Modi as, how would you address Syed Ali Shah Geelani? If Kashmiris don’t want to be a part of India-I respect that sentiment. The second problem is that the kashmir valley,that doesn’t want to be part of India,is barely ten percent of the land area of the whole state of J&K-so how do you separate an entire state based on what the will of the occupants of one tenth of its land area ? They shouldn’ speak for all the residents of the state,60% of who’re non-muslim kashmiris. My heart goes out to Kashmir for the recent floods. Every Indian (and I am sure Paksitanis as well) are extremely saddened by loss of lives and properties. But talking about political and social situation in Kashmir,when will Kashmir owe atleast some responsibility for its turmoil? I consider them as my brethren, but when will this ploy of victim-hood end? Yes, there have been some atrocities in the past by army, but the same atrocities have been done to army and non-Muslims as well. Hate is never a 1way street. Kashmir enjoys lowest taxation, utmost subsidy, enough central grants, and still they enjoy the freedom to bash their giver. Time to owe up responsibility and be a constructive member of the modern world.Else no one could and would care about you. Beautifully written blog! It was almost like I looked at a virtual tour of Kashmir!